Visiting the Grand Canyon is not so easy for someone with fear-of-heights issues, but it gave me an opportunity to face the sort of fears I force on my characters. Here's a picture from the edge. It doesn't seem real, does it? Just so much vast size to take in. The river is buried down in that crevice in the center. In this shot you can see the switchback trail going down from the South rim. And the tiny dots near the bottom of the first section are people. (There's also a small piece of trail visible below it.) I couldn't believe how many people and mules used this trail to get down to the river. My hubby was eager to try it, but we didn't have time and I didn't have the nerve. 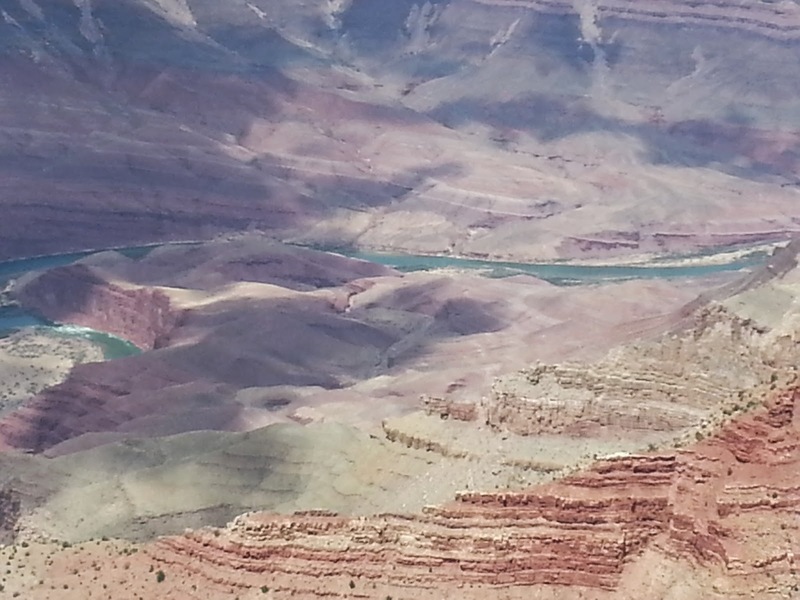 I like the sections where you can see parts of the Colorado river. It helps give perspective and the color contrast is beautiful. See how it corkscrews around on the left. 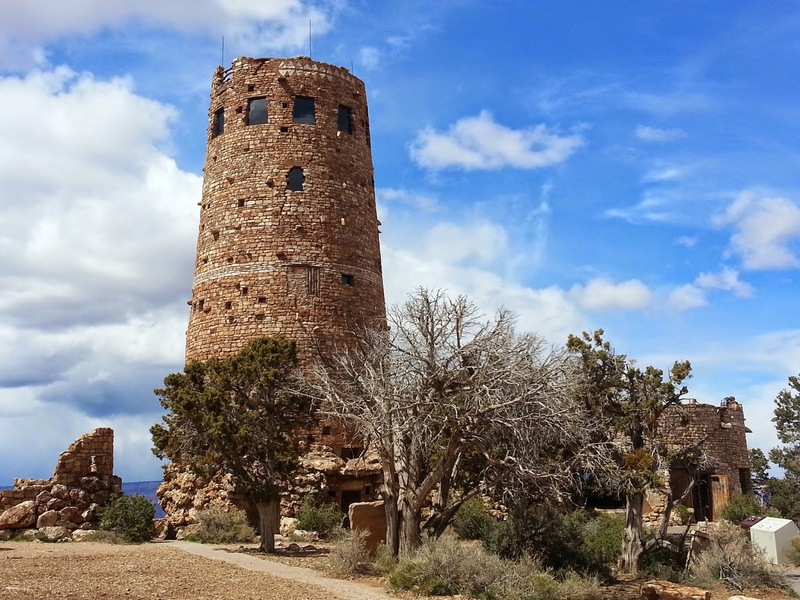 Built to look old, the WatchTower gives a great view from the eastern side of the South Rim. The North Rim was still closed for the winter. We also stayed farther south in Tucson where it's much warmer. My dad winters there. This is a saguaro bloom, one of only three we found blooming. Over 15 years in Tuscon and my dad had never seen one before as they always bloom while he's heading like a snow bird back home. Hearing how dry it is there doesn't adequately substitute for actually experiencing the hot, dry weather for yourself. Now I can truthfully place characters in such a situation having lived 1 percent humidity. Nothing like experience to make a book feel real. The views aren't bad in Tucson either! Lots of tall saguaro's in this picture and the smaller cactus too. On the cute side, a visit to the Desert Museum gave me this shot of a hummingbird on its nest. And what would a vacation be without some BOOK RESEARCH!!! My wip is set in a Spanish theme, perfect for Arizona. We got to visit a restored 200 year old Spanish mission church that is still in use. San Xavier gave me lots of ideas. You can't see it so well, but the top figure on the right has a knife in their chest. How can that not spark a story! 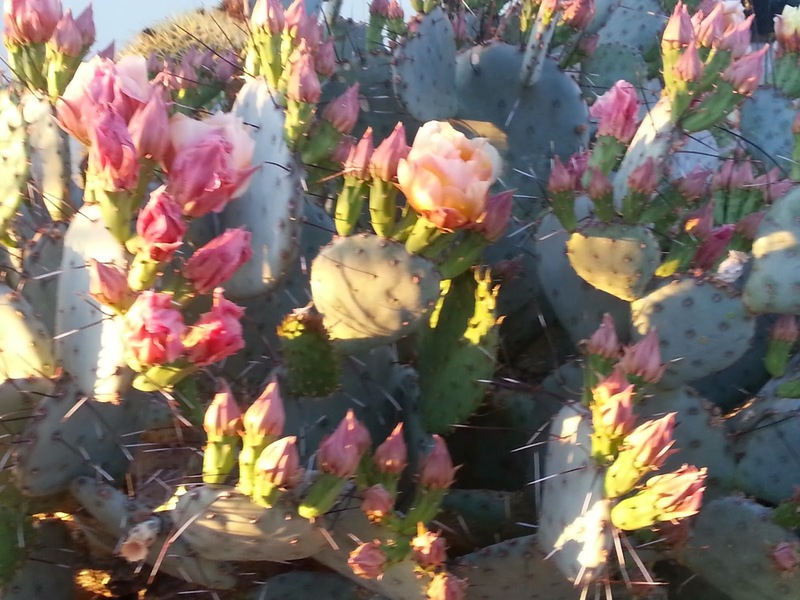 Beautiful amid the thorns, that's my memory of Arizona! It's given me loads of inspiration! Wow! Some great shots. Would love to visit that area some day. Looks gorgeous. My aunt took that trail ride down on the burros years ago. She said they give you a stick to hit them with because the group needs to stay together or they have trouble keeping on the trail. She was terrified! The Canyon is beautiful, though, especially on a partly cloudy day. My WIP is a MG set in Arizona and features some melt-your-eyeballs heat in the outdoor scenes. Gorgeous pics! I got to do a 5 day endurance ride on the north rim of the Grand Canyon. There were a few spots where we rode within 5-10 feet of the edge. An amazing place. I'd love to ride my horse down, but they (wisely) keep the trail limited to hikers and mules. Ahh it's so beautiful. I went there many years ago and these pictures bring back the memories!